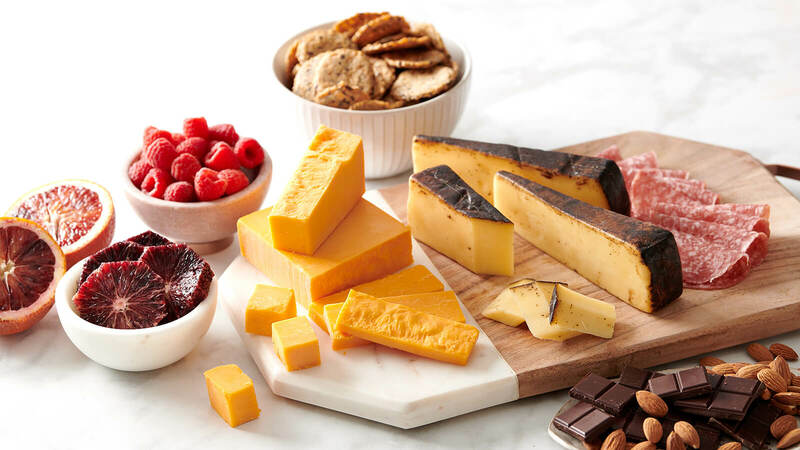 Explore our delicious new selection of cheddar cheese. More cheese is always a good thing. We always want to offer you the very best regional, American artisanal and European cheeses, including fresh takes on popular favorites. 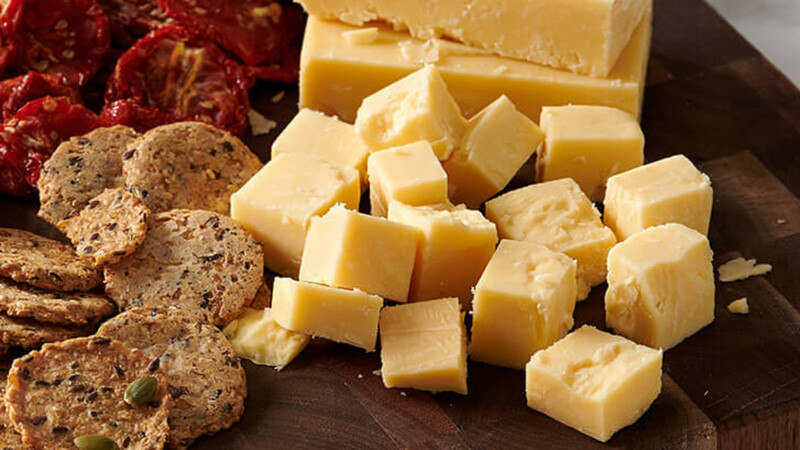 We’ve expanded our selection of cheddar cheese, selecting some of the finest innovative cheddars from around the country—and the UK. This ever-popular cheese first originated in the village of Cheddar, England and is now produced in countries around the world. Our newest spread features sharp, tangy flavors, unique ingredients like espresso and lavender and textures ranging from creamy to delightfully crumbly. We’ve also included pairing and serving suggestions, so you can make your cheddar even better. WISCONSIN AGING AND GRADING 5 YEAR CHEDDAR We selected this 5-year cheddar from a limited private reserve in Wisconsin. It’s rich, creamy and balanced, with a pleasantly sharp flavor. Our favorite way to serve it: Try it shredded on chili, omelets or soup. If you’re arranging a platter, keep accoutrements like French bread, salami, prosciutto and honey on hand. Wine & Beer Pairing: Enjoy this cheese with Merlot, Syrah, Cabernet Sauvignon, Riesling, Sauvignon Blanc and Zinfandel. Or Pale Ales, Porters and Stouts. BARELY BUZZED CHEDDAR This unique, aromatic cheese is hand-rubbed with roasted coffee and lavender buds and allowed to mature for 8 months. It’s creamy and smooth with subtle notes of butterscotch and caramel. Our favorite way to serve it: Pair with toasted nuts, chocolate, fresh fruits or charcuterie. Not available in all stores. Wine & Beed Pairing: Enjoy this cheese with medium and full-bodied wines and Ports. Or Ales, Stouts and Ciders. WYKE FARMS IVY’S VINTAGE RESERVE CHEDDAR Aged for a minimum of 15 months in Somerset, England, this cheddar has been crafted using the same family recipe for more than a century. Ivy’s Vintage Reserve is sharp and crumbly with lingering flavor. Our favorite way to serve it: This cheese is best served on a cheese board, added to casseroles or melted into a savory dip. Wine & Beer Pairing: Enjoy this cheese with Cabernet Sauvignon or Pale Ales. SIERRA NEVADA ORGANIC WHITE & SMOKED CHEDDAR Since 1997, the cheesemakers at Sierra Nevada Cheese Company have been committed to using clean, natural ingredients and traditional manufacturing methods to produce the purest, best-tasting artisanal cheeses. Each one is certified organic and made from raw grass-fed cows’ milk. Using raw milk keeps the cheese’s original nutrients intact and also adds deliciously complex flavor. 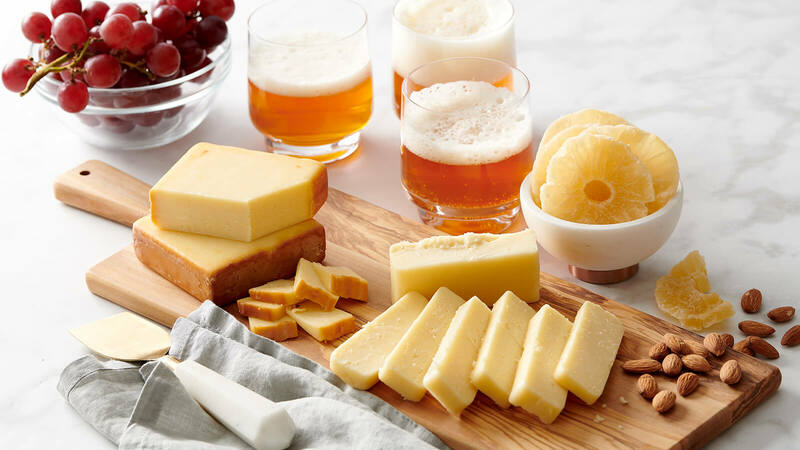 Our favorite way to serve it: Try Sierra Nevada White and Smoked Cheddar Cheeses by themselves, paired with crackers or sliced on a cheese board with fresh fruit. Wine & Beer Pairing: Enjoy these cheddars with Merlot and Malbec. Or Pale Ales, Porters and Stouts.